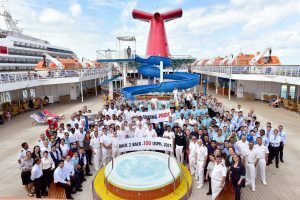 Carnival Elation scored 100 during its recent United States Public Health (U.S.P.H.) inspection which took place in Jacksonville, Fla. This marks the second consecutive time the ship has achieved a perfect U.S.P.H inspection score. The 2,052-passenger Carnival Elation operates year-round four- and five-day cruises from Jacksonville, carrying 170,000 guests a year from JAXPORT.